Hose Stations are widely used in dairy, pharmaceutical, food processing, chemical and industrial plants. 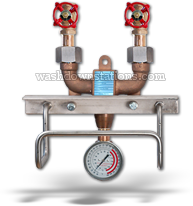 Wherever efficient, economical and low-maintenance means of hot-water clean-up is needed, Washdown Stations are used. The most widely used cleaning method, the mop and bucket, risks cross-contamination. Hose reels and washdown stations assist in fighting bacteria and grime. However, without the right chemical mix and adequate water pressure, they can't get the entire job done. Washdown Systems are an excellent sanitation solution for commercial and institutional facilities. Products include: Hot & Cold Water Mixers, Steam & Cold Water Mixers, Hot & Cold Water Mixers with Thermostatic Control, Hand Held Spary Nozzles/Guns, Spray Lances, High Pressure Hose, Hose Racks and Hose Reels.